Welcome to Volume 3, Issue 1 of the Australian Medical Student Journal. As always, we hope this issue offers excellent food for thought for budding doctors and researchers. From our deputy editor, Hasib Ahmadzai, comes an editorial reflecting on the role of medical students in medical discoveries in the past. It goes to show that when medical students get to work, it is amazing just what we can achieve! Australian of the Year and plastic surgeon Prof Fiona Woods entertains us with stories of how her early experiences stretched her mind and informed her later discoveries. Our other guest author, Sir Gustav Nossal, uses his decades of research experience in immunology to provide an insightful discussion on the serious inequalities present in global health. The award for best article for Volume 3, Issue 1 of the AMSJ goes to Matthew Bray and Daniel Keating for their original research on ‘Immunisation and informed decision making amongst Islamic primary school parents and staff’. Their research was considered by editorial staff to be robust in methods and offering a unique perspective on an issue that is not often considered by practitioners in Australia. As a young journal, we host many changes each time we go through the publication process as we strive to continually innovate and bring readers the highest quality of student research publication. The editorial department has undertaken many of these changes. 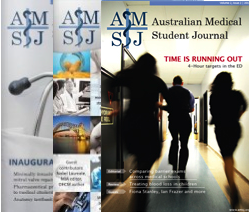 One of our aims has been to make the AMSJ a truly Australia-wide medical journal. This issue is the first for which we have recruited editorial and production staff from almost every state. 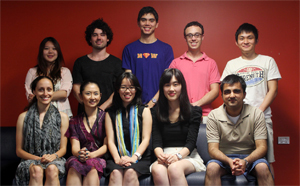 Our team has welcomed seven new editors and now represents ten different Australian universities. With both rural and urban students on board, we believe that the AMSJ is well equipped to encourage research across a wide range of medical practice settings. This is also the first time that the publication process has primarily taken place through email and teleconference, rather than face-to-face meetings. We have particularly benefited through the adaptation of cloud technology. With this change, remote collaboration has been made easier and more efficient. While we have engaged Australia on an organisational level, this issue sees further efforts to bring equal readership and access to the journal for all Australian students, regardless of location. This has culminated in distribution to not just every medical school in Australia, but also their 50 rural clinical schools and campuses. Furthermore, the AMSJ website has seen many advances to keep pace with current technology, including a touch-friendly mobile website (which can be found on your smartphone at www.amsj.org). Other upcoming events include the next round of recruitment for the AMSJ team in August this year. We would strongly encourage enthusiastic and dedicated medical students to apply for one of the many roles available. This is a unique opportunity to become part of a growing national organisation which encourages development of critical thinking, teamwork and research publication skills. We would like to extend our thanks to all of the voluntary AMSJ staff and external peer reviewers for their invaluable efforts in the production of this issue. To our readers: thank you for your continued support and we hope you will share our passion for medical student research.